JR East class 35 DMU. This train for the Sagami line consists of 2 coupled DMUs class 35. At lower speeds the motor's power is transferred by a hydraulic transmission, (power handle notches 1--5), but at higher speeds the motor's power is transferred by direct connection (power handle notches 6--8). 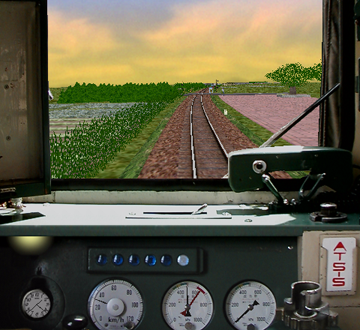 Photorealistic driver's stand with speedometer, 2 manometers (pressure gauges), clock, pilot lamp and indication of power transfer mode. The DMUs at the Sagami line had this red color scheme in the middle of the 1970s, the era that is simulated. Only later they were repainted in the Sagami line's color scheme: Cream white with a dark blue horizontal stripe. The creator's website has disappeared from the Internet long, long ago.